First edition. Limited edition. A wide margined copy. pp. (3), vi-xi, (5), 5-87. Stamp on title, browned and dampstained. Loose in later boards. Sm. 4to. Vinograd, London 45. London: G. Richardson & S. Clark, 1766. Luzzatto, an Italian physician resident in London, is regarded as the first truly modern lyric Hebrew poet. This innovative book of verse includes moralistic and occasional poetry. Most important are Luzzatto’s love sonnets, which have a remarkable lyrical quality. His songs of longing for Zion are similarly outstanding. 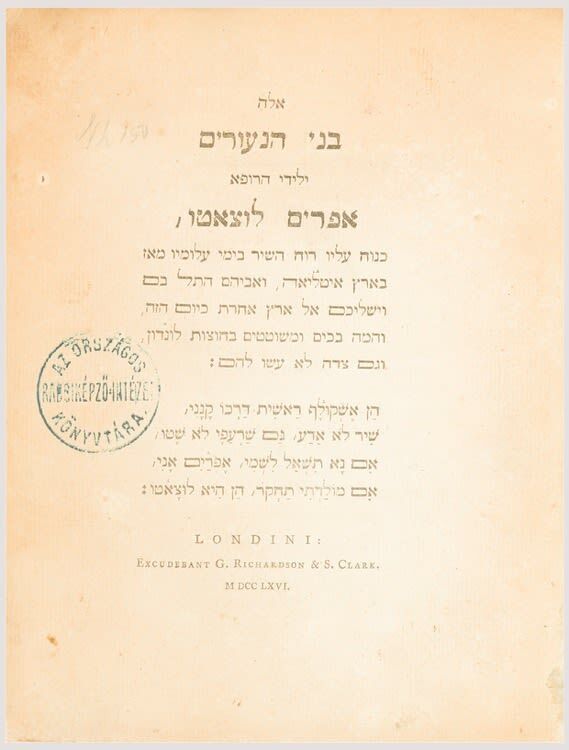 Luzzatto demonstrated the adaptability of the Hebrew language by abandoning the metres of medieval poetry and thus, he exercised a major influence on the revival of an imaginative Hebrew literature during the 19th century. See David Mirsky, The Life and Work of Ephraim Luzzatto (1987).